Teacher-created performance assessments can lead to deeper learning and powerful changes in instructional climate. Three students, one teacher, and a computer engineer sat around a table. Each student gave a five-minute presentation of a mathematical argument, using models and images in a digital platform to support his or her position. Students' topics ranged from triangle congruence to what type of 3–D solid makes the most efficient ship-ping container to get aid to a disaster zone. Afterward, the individuals at the table discussed the information, analyzed the argument, and progressed together toward deeper understanding of the mathematical relationships discussed. This scene occurred in my geometry class at Harvest Collegiate High School last June. Harvest is a public school in Manhattan's New York City Department of Education District 2. It's a small school that was founded on the principles of progressive educators like Ted Sizer and Deborah Meier. I am primarily a math teacher at the school, although I do have some teacher-leadership responsibilities, including serving as chair of the math department. The students gathered around the table that day were presenting a "gateway assessment," a high-stakes performance assessment that students must pass in English, math, science, and social studies to move from Harvest's "lower house" (grades 9 and 10) to the "upper house" (grades 11 and 12). The story of how this performance-assessment moment came to be is complex, but it starts and ends with a very sim-ple idea: I, the students' teacher, have expert knowledge about my students and math content standards, so I ought to have the power to assess those students' growth on those standards. Civil rights activist Ella Baker said, "The major job was getting people to understand that they had something within their power that they could use. "1 A consummate organizer, Baker was the "fundi"—Swahili for teacher of a craft to the next generation—whose lessons led activists in the sit-ins, freedom rides, and boycotts of the 1960s civil rights movement. She understood that caring, community-based activists are best positioned to work effectively on behalf of a community. She also understood that developing those individuals' capacity to recognize and claim the power to implement solutions would be the first and most difficult step in driving positive change. Over the last three decades, power dynamics in educational assessment have gone in the opposite direction. The power of community-based educators has been siphoned off and handed to district and statewide bureaucracies. From the middle of the 20th century, when states began experimenting with mandatory yearly testing through the Obama era and the "Race to the Top" program, we have seen states take a greater share of the power to assess learning and make decisions about student promotion, teacher ability, and school effectiveness based on these assessments. Harvest students must take high-stakes performance assessments at two points in their careers at the school. By the end of 10th grade, they have to complete and earn a passing score (determined by department rubrics) on their gateway presentations. By graduation, students must complete and earn a passing score on an essay and defense of a capstone project. Each department creates and norms the assessments; multiple people assess every essay and presentation to ensure that teacher bias does not affect students' scores. These summative assessments have influenced assessment at every level of our school, deepening the entire teaching and learning process. Formative assessments that lead to the gateway and capstone engage students by giving them some control over the types of problems they are solving. They also encourage students to work harder by providing opportunities for deep thought about content and for revision to make their work more precise. Performance assessments give me meaningful feedback in real time about what students know and don't know. The performance of math learning helps me pinpoint areas of strength and struggle, which allows me to modify upcoming lessons to take advantage of what students know as I support them in areas of potential growth. Performance assessment is the norm at my school, but what about in other contexts where students must pass a standardized test to graduate high school or in schools where teacher and school performance is determined by test scores? Is performance assessment in the manner I've been describing possible in these contexts as well? I think it's not only possible but critical. In schools, districts, and states that are heavily test-focused, it's important for leaders to show teachers that they have something within their power. In these contexts, teachers must be empowered to recognize that they are better positioned than state bureaucrats to evaluate student growth. Students need regular feedback from the professionals who know them best. Families and communities need to hear from educators about the victories—small and large—that happen every day in classrooms, not just at the end of the year. Below are three ways that district and school-based leaders can help teachers embrace the power they have and encourage them to design, implement, and reap the benefits of meaningful, teacher-created assessments. 1. Give teachers time to explore examples. Most of us attended schools that gave state-mandated tests when we were students. And because most teachers succeeded in schools with this culture, we may have a kind of "survivorship bias" toward this kind of assess-ment and the related test preparation. Assessing our learning this way worked for us, so why shouldn't it work for our students? Thirteen years of school experience will not be undone in an afternoon of professional development. In-stead, to counteract this bias, teachers need time to grapple with, debate, and understand alternative assessment mod-els. There are plenty of examples of performance assessments that school leaders can share with staff as sources of discussion and inspiration. Start with examples from reputable organizations (such as Authentic Education, www.authenticeducation.org) or discipline-specific teacher bloggers (such as Dan Meyer in math, http://blog.mrmeyer.com). The key in exploring these examples is depth over breadth. Do not pass out a huge packet of sample tasks. Instead, give teachers time and space to think about and critique a few of the assessments. Even more powerfully, you can use professional development time to highlight and refine performance assessments written and implemented by teachers in your own community. When I led the math department at a school with traditional assessments, I found a couple of teachers who used alternative assessment approaches and asked them to present their work to our team. One teacher had a problem from a test that required students to identify quadrilaterals, such as rhombi or parallelograms, based on a small set of characteristics. We worked together to turn the problem into a "who dunnit" mystery performance task. Students would solve a crime committed by a quadrilateral using eyewitness accounts about the perpetrators' diagonal lengths or angle measures. Another teacher wanted to assess students' knowledge of geometrical representations of quadratic relationships. We worked together as a department to help her turn a test on factoring quadratics and simplifying rational expressions into an investigation of rectangular dart boards, which students later set up and tested by throwing sticky putty. This process allowed me to highlight the great work that was being done within the department while encouraging others to change their assessment strategies. 2. Think together about assessments and results. As teachers begin to rethink how they evaluate student learning, they will also need time to work together in the de-sign and data-analysis phase. At our weekly department meetings at Harvest, we spend at least an hour looking at an as-sessment a teacher plans to give—a semester before she plans to give it. We also spend at least one hour looking at student work completed on the assessment after it has been administered and evaluated by the classroom teacher. During the initial meeting, we critique the design of the assessment: Is the teacher measuring what she intends to measure? Is the assessment appropriately rigorous? Will she get meaningful information from all students who take the assessment (those at high, middle, and low levels)? Is the task meaningful and engaging? In one of these meetings, I shared a performance assessment that required students to design a more efficient popcorn container. Although we all agreed that the math content involved was important, my colleagues pushed back on the context, saying it was uninteresting. Together, we refocused the task around the question of how to ship supplies more efficiently to victims of a natural disaster or other humanitarian crisis. Both projects assessed students' understanding of volume and surface of 3–D solids, but the latter did so in a way that was much more meaningful and memorable. My students regularly tell me that using math to think about how to help people in need is a meaningful experience. If the American Red Cross brought me all these shaped container models and asked me which one I would choose as their new shipping container, I would choose the short and wide cylinder. As was shown above, the short and wide cylinder had the efficiency of 2.23 cm3/cm2. Meanwhile, the tall and narrow cylinder had an efficiency of 1.73 cm3/cm2 and the rectangular prism had an efficiency of 0.96 cm3/cm2. Using our department rubric, we evaluated the student's work and talked about the problem solving, mathe-matical communication, and reasoning shown in the text. Our ability to collaborate with colleagues in this way depends on building trust among team members. We all present tasks and student work, and therefore we all have the chance to critique and be critiqued. We deliver feedback using National School Reform Foundation protocols (www.nsrfharmony.org/free-resources/protocols/a-z), which help to structure our conversation. For example, we use the "consultancy protocol" to work through a problem or dilemma that might arise when we analyze student work. Also, I conduct these meetings as a teacher leader who is not an evaluator. Our principal sometimes joins us, but only as a fellow participant. Feedback from these sessions will not be part of a teacher's end-of-year evaluation, so it is not a high-stakes environment. The non-evaluative nature of these meetings prevents teachers from trying to present a "dog-and-pony" show, instead freeing them to bring real problems without fear of being judged. 3. Change your message around assessment. I have witnessed firsthand how standardized test-centeredness in a school can become a self-fulfilling prophecy. A principal gets feedback that test scores are low and need to be improved. He or she passes that message along to department heads who then start to talk to teachers about the need to raise test scores. Standardized test scores become the thing that people talk about and the focus of staff meetings, class instruction, and water cooler con-versations. Anxiety builds. Finally, test day comes, and then the results arrive. Either they are good ("Let's keep it up!") or bad ("We've got to get better! "), and the cycle starts over with even more atten-tion, urgency, and anxiety. Of course, no one in the school began a career in teaching because of a passion for higher standardized test scores. The real goal is to help students learn and use their minds well. School leaders must hone their message to make this the focus of staff discussion. Leaders can interrupt the test-centeredness cycle by refocusing the conversation on deeper goals and a critical understanding of the tools we use to get at those goals. Performance-based assessments place the power over those conversations back where it belongs: in the hands of the people closest to our students. If administrators and teacher leaders instead thought more about ways to measure healthy assessment habits, such as the depth of knowledge of their questioning and timeliness of feedback, they could promote productive processes and support teachers to become better assessors of learning. Instructional rounds (in which groups of teachers observe classes together) and Japanese lesson studies (in which groups of teachers plan a class together and observe its teaching) provide useful formats for school communities to think together about ways to measure student engagement or the rigor of class discussion. These healthier teaching and learning habits will lead to deep learning (and yes, higher test scores). That said, none of these strategies alone is a silver bullet for developing a culture of meaningful assessment at your school. Today's education culture has created systems that rip power away from teachers to evaluate learning and assess growth. But don't we want to create the kind of scene I described at the onset—one where our stu-dents think deeply about real problems, engage meaningfully with their peers and professionals in the field of study, and develop an ability to think critically both about the ideas of others and their own? In my experience at different kinds of schools, I have learned that we cannot "teacher-proof" the assessment system. That is, there is not a single standardized assessment tool that can replace the daily feedback of a caring, informed professional. Rather than further disempowering teachers in the assessment of learning, school and district leaders should find ways to help teachers realize the amazing power we have by virtue of our relationships with students and their communities. 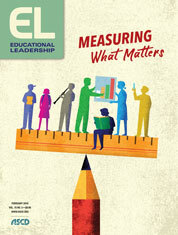 For a discussion of gauging instructional impact, see the online article "Evaluating the Artifacts of Student Learning" by Dwayne Chism. 1 Atwater, D. F. (2009). African American women's rhetoric: The search for dignity, personhood, and honor. Lanham, MD: Lexington Books. John R. Troutman McCrann teaches algebra, geometry, and physics at Harvest Collegiate School in New York City. He is chair of the math department and a union chapter leader. Follow him on Twitter.